This post is adapted from a poster at the U.S. Hydro 2015 conference, in National Harbor, Maryland. Mapping is the foundation of ocean exploration and marine spatial planning. In its mission to explore and broaden our knowledge of the oceans, the NOAA Ship Okeanos Explorer has collected high-resolution multibeam data as an integral part of its operations around the globe. Since 2013, the Office of Coast Survey has collaborated with the Okeanos Explorer during their expeditions, to improve hydrographic acquisition and processing methods and expand multibeam coverage in the Gulf of Mexico and Atlantic Ocean. The resulting bathymetry has supported a diverse array of oceanic research and contributed to the protection of ecologically critical habitats in U.S. waters. A new initiative between the Office of Ocean Exploration and Research and Coast Survey has opened the door to further maximizing the data’s usefulness. In alignment with NOAA’s integrated ocean and coastal mapping program’s philosophy of “map once, use many times,” this pilot project will integrate Okeanos Explorer multibeam data from the Gulf of Mexico into NOAA’s nautical chart update pipeline, and will expand in the future to incorporate data from the Atlantic and Pacific Oceans. Two surveys were identified during the Okeanos Explorer’s 2014 field season for a pilot project. The focus of expedition EX1402L1 (Survey W00286) was to test the vessel’s operational equipment and map the Florida Escarpment west of the Florida Keys. 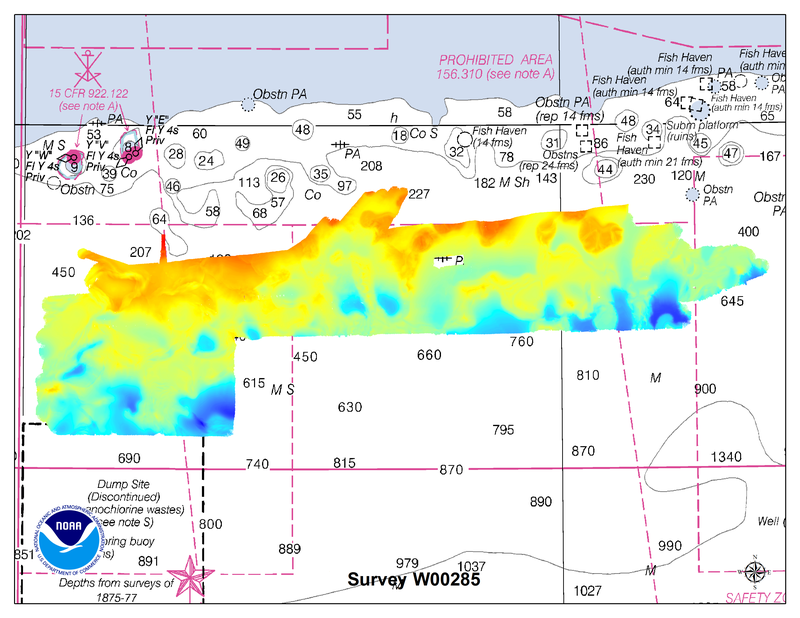 The primary goal of expedition EX1402L2 (Survey W00285) was to map the region southwest of the Flower Garden Banks National Marine Sanctuary and provide details to the scientific community about biological habitats in the area. Office of Coast Survey personnel provided field support and assisted with data analysis and documentation during these expeditions. Although it was not the original intent of these two surveys, Coast Survey assessed the data to determine whether it would improve the nautical charts in the project area. The source diagrams for the affected charts (11340, 11420, 11006, and 11013) showed that the sparsely charted soundings were based on partial coverage surveys dating from pre-1900 to 1939. In contrast, the Okeanos Explorer used a modern multibeam echo sounder (Kongsberg EM302) to acquire data with nearly complete coverage. Further analysis indicated that the Okeanos Explorer soundings were generally shallower than the charted soundings, in some instances by greater than 500 meters. Once it was demonstrated that the Okeanos Explorer’s multibeam bathymetry would significantly improve the charts, the Atlantic Hydrographic Branch incorporated the data into Coast Survey’s chart update pipeline. 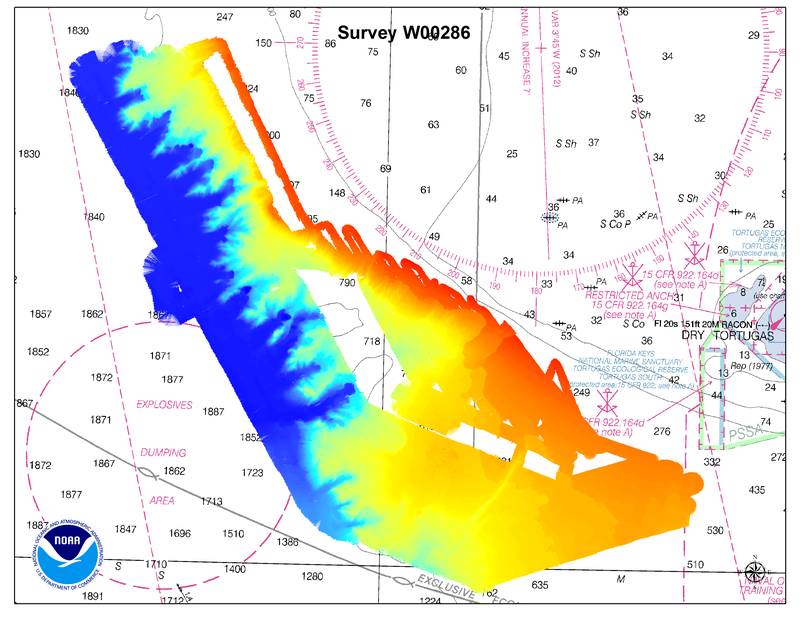 Branch personnel have applied uncertainty to the data, created CUBE surfaces, written descriptive reports to document the acquisition and processing methods, and conducted a survey acceptance review to ensure that the data meets the relevant NOAA specifications for nautical charting. Coast Survey is currently compiling the data to update the affected charts. The various sources of the Okeanos Explorer’s vertical uncertainty need to be better accounted for within the CARIS total propagated uncertainty computation. These include tide uncertainty and sound velocity corrections (expendable bathythermographs). In addition to the surveys already being evaluated, there is an additional 60,000 square nautical miles of Okeanos Explorer data along the Pacific Coast and Hawaii that can potentially be used for nautical charting. The Atlantic Hydrographic Branch is evaluating Okeanos Explorer data that covers over 62,000 square nautical miles in the Atlantic Ocean and the Gulf of Mexico. (The surveyed area is larger than the land area of Kansas!) Coast Survey would like to use the data to update over 30 nautical charts. Atlantic Hydrographic Branch’s physical scientists will continue to collaborate with the Okeanos Explorer and the Office of Ocean Exploration and Research to provide support, improve data acquisition and processing methods, and transfer data from the ship for chart compilation. Commissioned in August 2008, the NOAA Ship Okeanos Explorer is the nation’s only federal vessel dedicated to ocean exploration. With 95% of the world’s oceans left unexplored, the ship’s unique combination of scientific and technological tools positions it to explore new areas of our largely unknown ocean. These explorations will generate scientific questions leading to further scientific inquiries. Through the Okeanos Explorer Program, NOAA’s Office of Ocean Exploration and Research provides the nation with important capabilities to discover and investigate new ocean areas and phenomena, conduct the basic research required to document discoveries, and seamlessly disseminate data and information-rich products to a multitude of users. The program strives to develop technological solutions and innovative applications to critical problems in undersea exploration and to provide resources for developing, testing, and transitioning solutions to meet these needs.